Habitat for Humanity Williamson-Maury (HFHWM) build site volunteers may not hear it coming but they won’t be able to miss the nonprofit’s new Nissan LEAF, donated by Nissan North America. 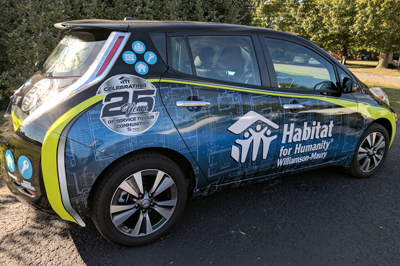 This 2016 all-electric car is wrapped in eye-catching graphics, serving both as a much-needed way to get staff and materials to the build site and a vehicle to raise awareness of the nonprofit’s affordable housing mission. For the last 11 years, Nissan has sponsored and volunteer-built a whole home each year for the HFHWM affiliate. This year’s HFHWM Nissan Build begins October 5th in Fairview, TN. Over the next six weeks, 300 volunteers from Nissan’s corporate office in Franklin will donate their time to build a home with the Williams family. After completion, the home will be sold to the family with an affordable, no interest mortgage. Nissan has contributed more than $15 million to Habitat nationally since the partnership began in 2005, when Nissan donated 50 trucks and mobilized employees to assist in home building following Hurricanes Katrina and Rita in the Gulf Coast region. Members of the Centennial Habitat High Club pose with the new Nissan Leaf before it heads out in the Centennial Homecoming Parade. Nissan has continued to support Habitat’s disaster response program through the years by providing more than $500,000 in funding and seven mobile response units. 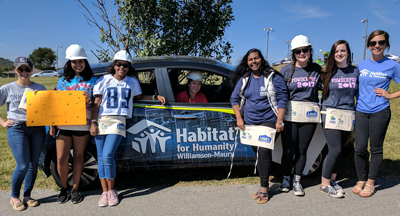 Nissan has donated an additional 93 trucks and helped to build 85 homes across the U.S. Nissan’s employees have logged more than 97,000 volunteer hours with Habitat for Humanity. For additional information or to get involved as a donor, sponsor or volunteer for HFHWM’s home build or critical repair programs, please contact Jennee Galland at 615-550-5617 or visit www.hfhwm.org.